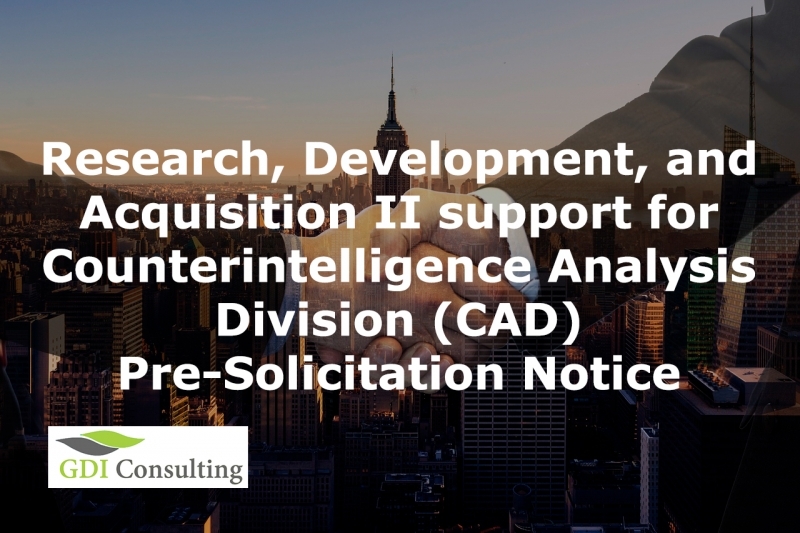 The Pre-Solicitation notice was released in the FBO regarding the Research, Development, and Acquisition II support for Counterintelligence Analysis Division (CAD), a contract opportunity issued by Other Defense Agencies, the office of Virginia Contracting Activity. The purpose of this non-personal service contract is to provide effective Research, Development, and Acquisition analysis services for the CAD office. Some of the main objectives of this contract include strategic-level analytic support through focused DoD RDA, S & T, DCIP/CoG, and CFIUS against FIE and other targeting while assisting them in the accomplishment of DIA’s CI mission in a wide range of CI activities. Furthermore, through this project, the Government is requiring a partnering with field and national-level CI organizations to ensure identified threats to DoD RDA, S&T, DCIP/CoG, and CFIUS areas are effectively identified, focused, and addressed in order to achieve maximum success in countering from foreign intelligence entities and other collection threats. Some of the main tasks that the contractor is obliged to complete during the period of performance include, but are not limited to CI Analytic Support and Program Manager Senior Analyst. Both of these points are described in detail in the full draft RFP document. What Potential Contractors Should Know? The notice shared in the official website of FBO is a pre-solicitation and the Government states that the Final Solicitation might undergo changes. This is a guide for Offerors to start preparing for proposal submission. This a Competitive 8(a) set aside acquisition and single-award contract that will be conducted using FAR Part 12 procedures. The Government plans to issue a Time & Material contract to the most successful offeror. Its period of performance is 1-year base period and 4 one-year option periods. Offerors are instructed to provide complete and accurate information as described in the Draft RFP, in order to allow the Government to fully assess an Offeror’s ability to provide the required services and determine whether it represents the best value to the government. The first submitted proposals will be evaluated and the decision on their validity will be made directly, therefore, quality should be a priority for all potential contractors. Other copies sent subsequently will not be reviewed. Compliance is one of the most important aspects that offerors should focus on, ensuring that all solicitation requirements are met effectively when preparing the proposal including terms and conditions, representations and certifications, and technical requirements, in addition to the identified evaluation criteria factors. It must include all data and information requested by the Instructions To Offeror’s, be clear, concise, and shall include sufficient detail for effective evaluation and for substantiating the validity of stated claims. A Compliance Matrix is provided to help interested parties follow the proposal instructions constructively. On the contrary, they risk being excluded from the competition! This process permits tradeoffs among Price and non-price factors and allows the Government to select other than the lowest Price proposal, or other than the highest technically rated offer. Moreover, the Government intends to award without discussions.